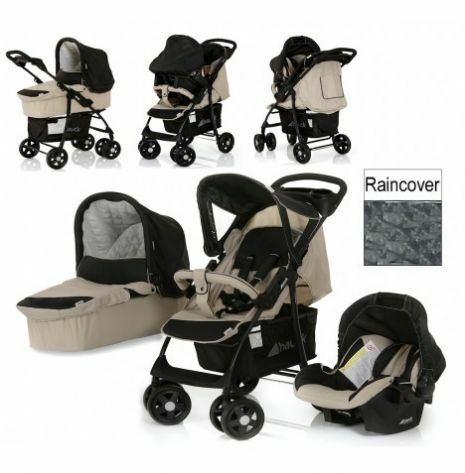 The Hauck Shopper Trio Set Travel System includes pushchair, hard carrycot & car seat . Its lightweight, robust frame and extra-large wheels and suspension make an easy job of tackling the toughest of terrains, and shop ‘til you drop with the large shopping basket, parent tray and handy cup holders. For the infancy stages, the hard, protective carrycot can be secured to the pushchair to face the parent, allowing you to keep a constant eye on the little one safe inside. In addition, the car seat fits on the pushchair frame in the same fashion and is suitable from birth until aprox. 12 months old (13kg). After this time, the pushchair is to be used as a forward facing stroller up until your child is simply too big for the buggy. Combined with the Zero Plus car seat group 0 + which fits into the built-in armrest adapters the Shopper 11 can convert easily into a shop'n Drive travel system. Suitable from birth - 3 years. Parent tray with cup holders. There is a one hand continuously adjustable backrest.
. Babies are vulnerable and the hauck Zero Plus is the ideal solution for security and mobility.
. The Zero Plus has a new side impact system that provides the best protection whilst in a car. With the patented use of materials the Zero Plus has achieved excellent test results in front and side crashes from ADAC and Stiftung Warentest.
. In everyday life this car seat promises flexibility and comfort. With the built-in adapters, it instantly converts a range of buggies into a shop'n drive travel System.
. Additional protection is provided for your child by the centrally adjustable 3-point padded seat belt and the additional head protection insert.
. Suitable for newborns and infants up to 13 kg.